TAVES 2013 – First Show A Blast! Although I was invited to contribute products to RMAF, TAVES was my first chance to attend an Audio Show as a vendor. Thanks to the graciousness of Steve from Audio Sensibility who provided me with space at his table TAVES proved to be a great opportunity for exposure. Audio Sensibility has a good profile with quality and affordable products, not to mention the best spot in the venue for vendors, and that drew a lot of people to the table. I talked to so many people there was barely time for lunch or to sit down but who’s complaining. 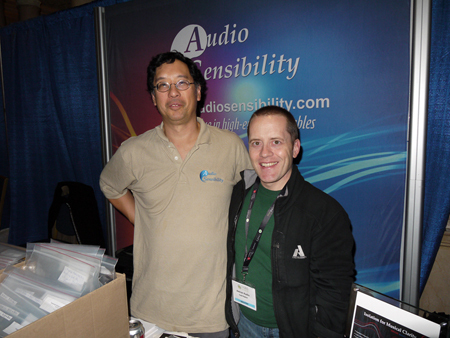 I met a lot of fellow audiophiles including a lot of people from the Canadian Audio Mart. I also made some great connections and the promises of opportunities in the future. Of great note was the success of my Dustylus Stylus Cleaner, which seemed to generate some buzz around the show. By the end of the show people were coming to the table specifically to ask to buy it and that was a great feeling. I may even get a distribution contract for this product, which promises to be a strong competitor in the market. Hopefully for the next show I will have my own table. Can’t wait! This entry was posted in Audio Shows on November 11, 2013 by admin.